Today was a good day. I started with sitting down with two large glasses of water and my Bible. It was a great start. I had a cup of multi-grain cheerios and a handful of almonds and dried fruit. At work, I had some coffee with a little almond milk. Lunch was a slice of lean meatloaf, a few potato wedges, and a leafy green salad with strawberries and a few almond slivers. My snack was a couple squares of 85% dark chocolate! After work, I stopped by the gym and sauna for about 40 minutes with my friend Leigh. I had plenty of water today! Dinner was a Trader Joe’s salmon burger on my homemade multi-grain bread with a little lite mayo, mixed greens, tomatoes, and onions, some baby carrots, steamed green beans with sautéed mushrooms, garlic, some bacon, and a little bit of diced potato, and some fresh pineapple for “dessert.” I made my calorie goals again today, so I’m pleased. I feel full and good, and my workout was refreshing and stress-relieving! Dinner is served! Who says healthy isn’t delicious?! Today was likely the coldest day of the year so far. I got sent home early from work because of icy roads, so I had a chance to get in some R&R, including baking some multi-grain bread with flax, sesame, and poppy seeds. It turned out pretty good. Next time, I’m going to try soaking the oats before adding them to the dough though, to see if it will help make the bread more moist. When Bryan got home from work, we had a “date night in” of homemade pizza (light on the cheese; heavy on the vegetables) and watched a movie, before heading to bed early. Woke early and sent Bryan off to ski with our Jr. High group from church. Never did fall back asleep. Finally rolled out of bed around 9AM and had a cup of coffee and some leftover pizza from last night’s “date night in” (I’m a sucker for cold pizza for breakfast…don’t judge.) Went to a workout with my friend Leigh at GOGA Studios–it was an interesting concept, working out on a vibrating platform, so your muscles have to work extra hard to stay balanced. I especially enjoyed the vibrating massage and sauna! It took a little longer than planned, so I ran straight to my next appointment without eating lunch (bad idea). Today was the day we got our cow! No, we’re not becoming farmers; several families in our church went in on a cow and had it butchered. It’s a semi-hefty chunk of cash up front, but then I don’t have to buy beef for a whole year (we still have about 8 packs from last year, so we’ll try to use those up first). Last year, the friend who ordered the cow separated it all out himself; this year, several of us decided to pitch in and help with the heavy lifting (literally…grand total of about 1,460 pounds between 9 families!). Not sure if I’m more sore from GOGA or beef sorting, but it was a good day’s work…took about two hours to get it all separated out. Had a quick (albeit late) lunch, then closed my eyes for about 15 minutes before the nephews arrived so my sister and her husband could have a date night. We had a good time, filled with Wii and Stratego and homemade hamburgers. After yesterday’s extremely long and exhausting day for both of us, we declared today’s day of rest to actually include rest, so we went out to lunch using a gift card from Christmas at lunch. It was a nice break from cooking. Trying to eat no dairy at a restaurant is more challenging than I thought. Fortunately, the chef was happy to cook the green beans in olive oil instead of butter and to put the cream sauce on the side; besides, the grilled chicken was very flavorful without the sauce, so I’m not sure why I would want to add the extra calories anyway. Bryan had steak and shrimp with green beans and rice, and we both had salads too (we skipped the bread basket and dessert, and both of us brought half of our lunches home for another meal). I thought about going on a walk, but after all the workouts we did yesterday, I opted to take a brief nap before evening service. Then Bryan made curry for dinner! And we were in bed by about 10:30! Tired today, which is weird since we went to bed earlier than normal last night. Drinking lots of water. Breakfast was sourdough toast with peanut butter and marmalade and a cup of hot green tea. Good 30 minute workout at lunch, followed by a meal of meatloaf, potato wedges, green beans, and a pear. A good day of work, but ready for another early bed time. We’ve been getting to bed earlier on these more active days, and it makes it easier to get up the next day, so I want to keep this pattern going while I can. Bible reading has not been quite as good this past week, so I’m excited to jump back into John and Exodus this week. I think if I can discipline myself to get to bed on time, I would be able to concentrate most effectively on the Word first thing in the morning–with a cup of coffee in hand. After a supper of curried lentils and a mixed greens salad with strawberries, leftover grilled chicken, slivered almonds, and avocados, three of my friends came over for our bi-weekly Bible Study and Fellowship. It was good to rehearse the works of the Lord over the past two weeks, and to pray together for His strength through the next two weeks and beyond. I was once again overwhelmed with my unloveliness and Christ’s great and unconditional love. The nutritionist that looked at my irises told me that I had a strong constitution, but that I had a severe intolerance, if not an allergy, to dairy products. I knew I was somewhat sensitive to dairy, but she told me that if the lymphatic system was overly taxed by fighting the dairy, it could adversely affect my thyroid and/or heart. (I will have to do some research on this, of course. So far, I do not have any problems with either, but it did make me want to get off the dairy, at least for a trial period.) So, I am cutting out dairy from my diet for at least a month, maybe two, to see if I can see any change. She also said (because of my blood type and eye color) that “Cardio exercise is like eating for you–don’t go a day without it.” So, meanwhile, I’ll be increasing my workouts and water intake and replacing the cream in my coffee with almond milk and coconut milk. After the nutritionist appointment, I had coffee with a new friend downtown. We had a good time laughing and sharing what God had been doing in our lives. It was a good night. Still eating lots of fruits and vegetables, whole grains, low fat dairy, and lean meats. Down 3 pounds so far. Finally broke down and bought an elliptical with some Christmas money. We did a lot of research and finally bit the bullet on the Nordic Track ACT Elliptical from Sears Outlet. It took three of us to get the box into the house, then we broke open the box and carried the individual parts upstairs (there was no way we would have made it up the stairs with the box intact). Only downside…they forgot to put the hardware in the box, so we’re waiting on the company to ship us the nuts and bolts to hold the thing together. In the meantime, it was a really rainy week, so I’ve missed my walks. Creamy, Warm Curry Sauce + Citrusy, Fresh Slaw = Healthy Deliciousness! Bryan made steamed rice and sautéed chicken thighs with a coconut curry sauce. It was delicious! I tried a new recipe from Food & Wine Magazine: Brussels Sprouts Slaw with Peanuts and Pomegranate. I used regular oil instead of olive and hazelnut oils (b/c I ran out), and I used chopped roasted raw peanuts instead of hazelnuts. I forgot to add the Parmigiano-Reggiano, but I’m sure that would be a great addition too. Very citrusy and fresh! I enjoyed eating leftover Brussels Sprouts Slaw this weekend. Friday, I got to have coffee while walking with my good friend Ashley downtown. That evening, we had our new neighbors over for dinner. We had a really good time and I’m thankful for this new relationship. Saturday morning, my sister brought her boys over for some Wii Mario Kart and Bowling competitions. Always a blast! Good service this morning at church. And really good conversation with Bryan about goals and ministry philosophy, etc. A quick lunch, then another Sunday afternoon hike with the young adult group and a healthful stir fry dinner afterwards! It’s been pretty busy at work this week so far, but it’s enjoyable work, so I don’t mind. I’ve been starting my mornings with oatmeal topped with baked apples, trail mix, and flax seed for breakfast with my coffee. Lunch has been simple and healthful leftovers. Still low on the exercise until the elliptical parts show up, since it’s finally gotten cold here, but I am tracking my food most days and down a total of 5 pounds now! Encouraged. Also encouraged by various relationships at church. We had church supper tonight before prayer meeting, and it was amazing to see the Body working together: preparing food, serving, cleaning up, praying, hugs, conversations, etc. So thankful for each of the friends God has given me–and that the Gospel is bigger than what stage of life we’re in–single, married with no kids, college students, widowed, divorced, teenagers, working moms, stay-at-home moms, retired, kids, etc. God is SO big!! Saturday, how I love thee! Slept in…really late! Bryan heated up some turkey and cheese stuffed pasta shells, and we had a nice lunch. Drove up to Table Rock and hiked 6 miles! Whew! There were a few moments on the way up that I was a little leery, but the after about a quarter of the way in, it seemed to get a little easier. I’m so glad Bryan suggested hiking today! Stopped by “The Forest Coffeehouse” for a coffee on the way home (my reward for not complaining on the trail…or maybe just for finishing). Got home and took a shower, then had a quick bite to eat before dismantling the Christmas decor. It didn’t take as long as I thought it would, so that was a blessing. Overall, really great day! Challenged by Pastor’s sermon this morning from John 2. Then had “Journey Group” with our 2nd graders. Today, our journey brought us to God being “Never-tiring.” It was a great encouragement, especially since we had two little girls ask for prayer for their moms to get more sleep (before they knew what the lesson was about). Also, nearly everyone in the class knows someone who either has cancer or is really sick with something else; there are some kids that are dealing with heartaches that are hard for me to think about, let alone a second grader know how to process. But we talked about being able to rest in God because not only does He not sleep, He also never gets weary AND has the power to make all things new. It was a big concept, but I think they really got it! After a quick lunch, we headed to Paris Mountain for a hike with some of our young adult group. We ended up buying an annual pass–this is one activity Bryan and I are both really enjoying! Not sure exactly how far we went today, but I’m estimating close to 5 miles, based on the trail maps. Afterwards, it was back to our house for a grill-out of beef kebabs, grilled onions, peppers, and tomatoes, and some roasted lemon-garlic broccoli and cauliflower. Yum! So thankful for this group and how God has brought us together and worked on us through each other. Had some really good, Gospel conversations on the hike and tonight. Refreshed and ready to start a new week! Long day. Good walk with my friend Shannah at lunch today! It was exactly the break I needed to refresh and hit the ground running again at work. Had a yummy salad of mixed greens, vibrantly colored peppers, diced green onion and celery seed dressing, along with a delicious piece of pork tenderloin! I love it when my food is both nutritious and colorful! Spent a good chunk of my day in the Word, working on a Study Guide. For dinner, we made a big batch of jumbo stuffed shells, filled with lean ground turkey, cooked greens, and part skim cheese, onion, garlic, and plenty of herbs, and topped with homemade marinara sauce. 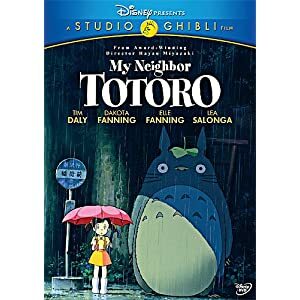 Then we watched My Neighbor Totoro, which happens to be one of my favorite anime films! It was a wonderful and quiet evening for a “date night in”! Started the day with some baked apples, a banana, and half of a bagel. Got a good start on my assignments for the work day, and then had a lunch of that beautiful salad (same as yesterday) and leftover stuffed shells–yum! Very profitable day at work…always encouraging, especially before a weekend! Tonight is dinner with friends, and I made a special loaf of artisan bread that has whole wheat, oatmeal, flax and sesame seeds. Can’t wait to pair it with Rachel’s Tomato Tortellini Soup! Today was another leftovers day, using up the last, lonely produce in the fridge. For breakfast, I had more multi-grain pancakes; lunch was a bbq beef sandwich. Had Ryan and Emily over for dinner, and experimented a bit. I had a bag of red potatoes that I sliced in the food processor with an onion; pan fried them in butter with some garlic, rosemary, salt and pepper. Meanwhile, we pitted and chopped a package of plums and simmered them in a little butter with the juice of a lime and two lemons, some honey, nutmeg, a little thyme, and a pinch of coarse salt. It turned out very good! At the last minute, I fried up an egg to top the potatoes and chopped up some strips of fresh green pepper. No workout today, unfortunately. Still working on getting to bed earlier so I can workout in the morning. Multi-grain pancake for breakfast; leftover bbq beef, red potatoes, and plums for lunch; a bowl of vegetarian black bean soup from Panera for dinner. Since we were out of food, we decided to go to Panera for dinner (using a gift card we got at Christmas) and pick up some groceries. No more exercise than walking for about 30 minutes through Target (does that count?). Breakfast was half a bagel with a little butter and a banana; dinner was the other half of the bagel; and lunch was plums, a large bunch of celery with some peanut butter, and two more of those multi-grain pancakes. Really busy day at work today–didn’t leave till about 6:25 tonight–but it was a good day. Had some good time reviewing the DFF6 script and searching Scripture for accompanying passages to use for the study guide; passages that stood out to me especially were Psalm 66, Isaiah 43, and Daniel 3. Unfortunately, I didn’t get to meet my friend to walk tonight, but it turns out my workout buddy forgot her gym clothes too, so it’s okay. I need to make sure I workout tomorrow! Fortunately, I’m still down 2 pounds from my New Year’s Day weigh in. Full day of work today, including putting away the company Christmas tree. Started with a breakfast of multigrain pancakes with pecans and cranberries, coffee and cream. Had a snack of baby carrots, celery sticks, and green pepper strips. Lunch was 4 oz. of pork tenderloin and a red potato with sour cream. After work, I went for a quick walk. I made it 2.25 miles tonight before my leg started aching, so I stopped a little short of the 3.1 mile goal and stretched instead. Bryan had a classmate over for games and dinner tonight. His friend is vegetarian, so I made a big, leafy green salad with tomatoes, broccoli, and feta, herbed mushroom risotto with smoked gouda, and buttered white beans with garlic and parsley. Who says rice and beans is boring? 😉 After cleaning up from dinner, I made a giant batch of applesauce from our last batch of fall’s apples. Looking forward to waking up tomorrow to the smell of apples and cinnamon! Wasn’t able to finish Genesis last night, so I finished it tonight. “God meant it for good” (Gen. 50:20) — He always does!